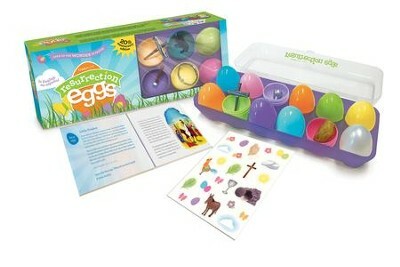 The Resurrection Eggs offer children a wonderful hands-on resource to learn about Jesus' Resurrection Story. Perfect for use at home, Sunday School, children's ministry and more, this set of 12 brightly colored plastic eggs crack open to reveal miniature symbols of Easter inside. Use the updated, illustrated companion booklet to help explain the significance of each object---perfect for opening up discussion about Easter and the Resurrection with kids, ages 3 years and older. Q: Do the 12 eggs in the 2014 Resurrection Eggs have 12 different symbols? The eggs come with 11 different symbols. 1 egg is empty. Q: What is the difference between the 2014 and the older ones? The updated edition includes an updated companion booklet in English and Spanish that features illustrated Bible stories that explain the significance of each object. it also includes decorative stickers. This comes with a booklet in English and Spanish that features illustrated Bible Stories explaining the significance of each object. I'm the author/artist and I want to review Resurrection Eggs, 20th Anniversary Edition.